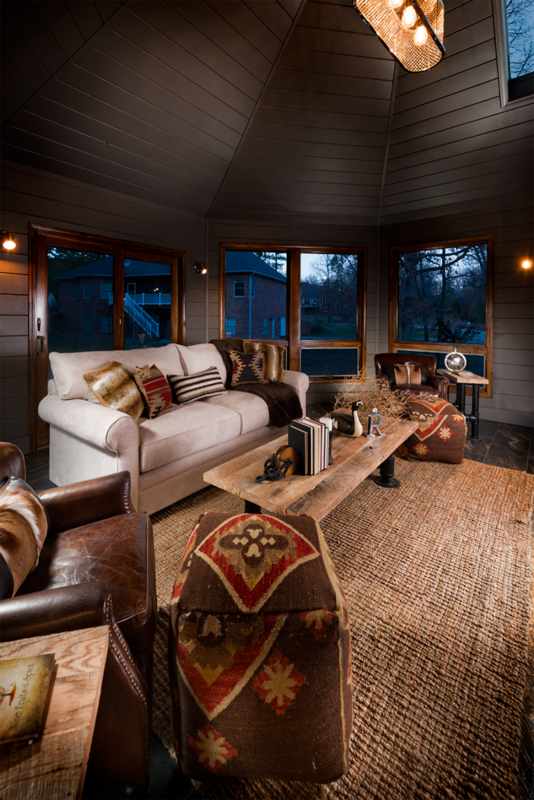 Mike and Tracey Renfrow purchased an ’80s-style ranch then worked with local craftsmen and designers to transform it into their very own industrial rustic dream home. 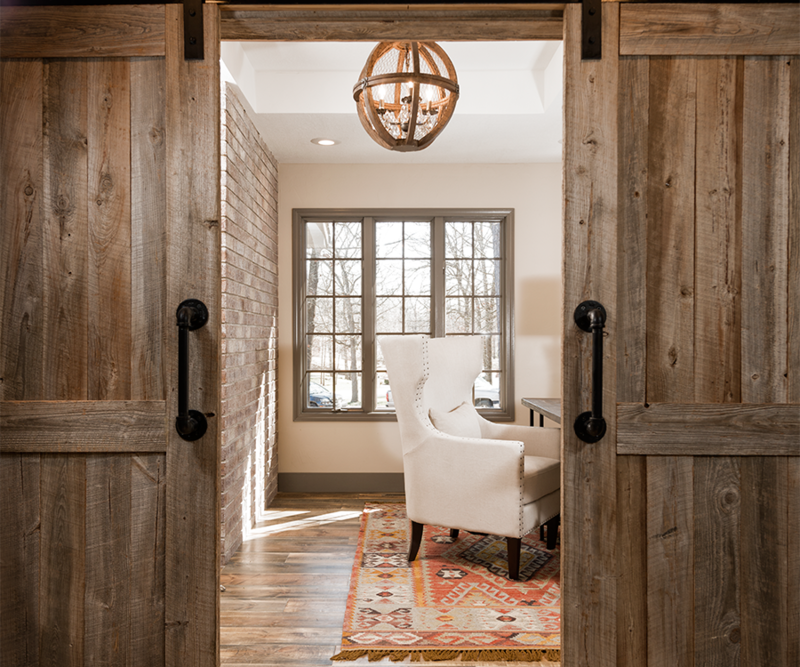 A couple of custom-made sliding barn doors separate the home’s office from the kitchen. Complete with a desk, a chair and a large window that lets in plenty of natural light, the space is the perfect spot to hole up and get work done. “I’m actually the one who uses the office most of the time,” Tracey says. Tracey is the owner of T.J. Swift House, an agency that provides residential services for individuals with disabilities. 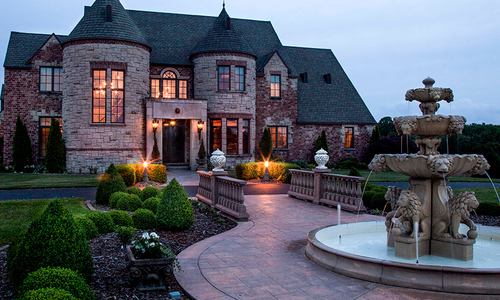 After the purchase, the Renfrows hired Beverly Moore of Interiors by Design (417-293-0616) to help with the transformation of the interior and exterior. They first met with Moore and reviewed photos to determine the Renfrows’ preferred style, which Moore describes as a combination of rustic, industrial and modern, and then they got to work. But Moore did much more than simply choose paint colors and art. “Beverly was also the one who helped find contractors and coordinated all of the labor,” Tracey says. Combined, the couple has four children and six grandchildren, so several interior walls were removed to create an open floor plan that works well for family gatherings. “We opened the wall between the kitchen and the living area, which worked out great,” Tracey says. “We did that with our blended family in mind. There are 15 of us total.” They also worked in many special custom details, such as old barnwood beams, hand-finished wood floors, a stair railing, a fireplace mantel, sliding barn doors and barn and wood tables that were all custom made. 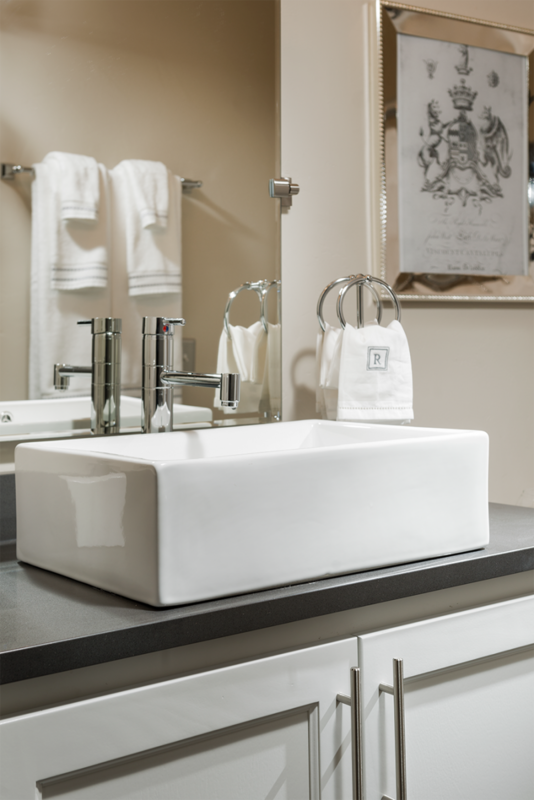 Tracey’s request for the master bathroom was rather simple: she wanted two sinks and a large walk-in shower rather than a tub. 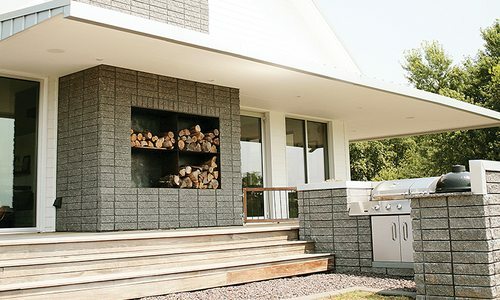 The room also features heated tile that looks like wood, plus custom cabinetry by Ty and Melynni Jolliff of Ozark Mountain Woodsmith, Inc., the company that built the custom cabinetry in the house. 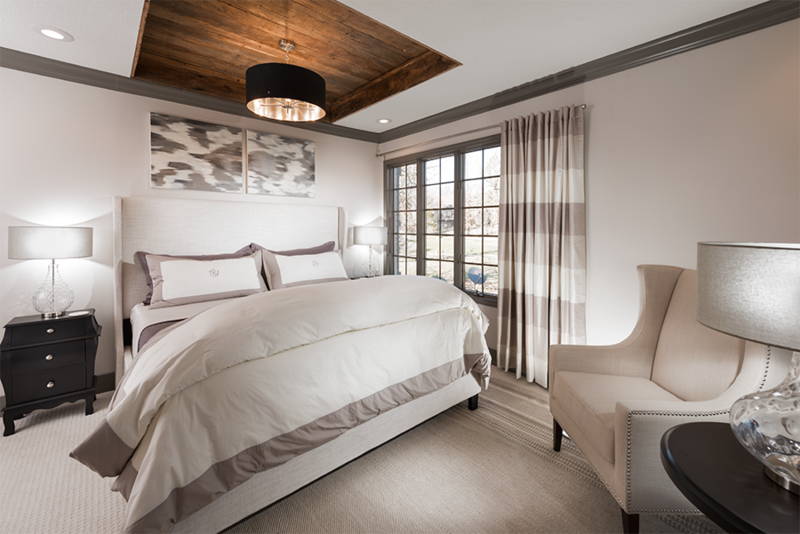 A raised portion of the ceiling in the master bedroom used to be painted blue, but the Renfrows replaced it with wood. “There’s a lot of wood in our home, which is nice, because Mike works in the lumber business,” Tracey says. The bedroom was actually made smaller in the remodel, because it was reconfigured to fit in two walk-in closets and a master bathroom. 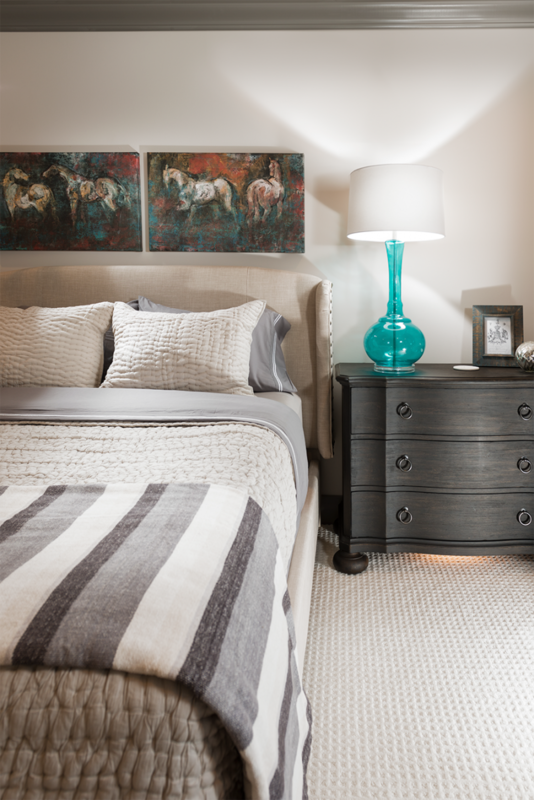 There are several pieces of art in the home that feature horses, including a painting that hangs in the guest bedroom. “Mike was raised with horses, and I was raised with horses, so it made it more personal for us,” Tracey says. The windows open to the front yard, and a bedside table in the room has a built-in light that works as the perfect night light. A major highlight in the kitchen is the 15-foot-long wood table that was made by Roger Beauchamp of Outback Woodcraft, who also made several other custom wood pieces in the home. 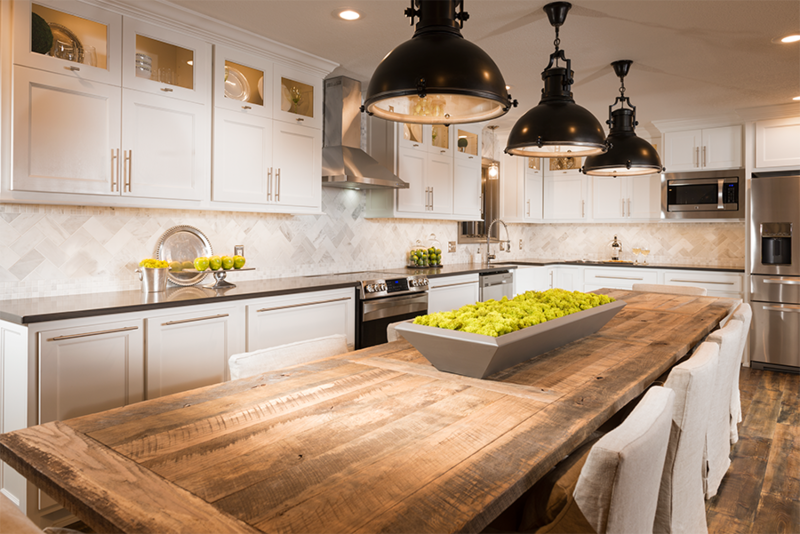 “The dining table is stunning, to say the least,” Moore says. “It stretches the full length of the kitchen! It was one of Tracey’s requests from the beginning.” Quartz countertops, custom white cabinetry and a marble backsplash also beautify the space, which provides plenty of room for family gatherings. 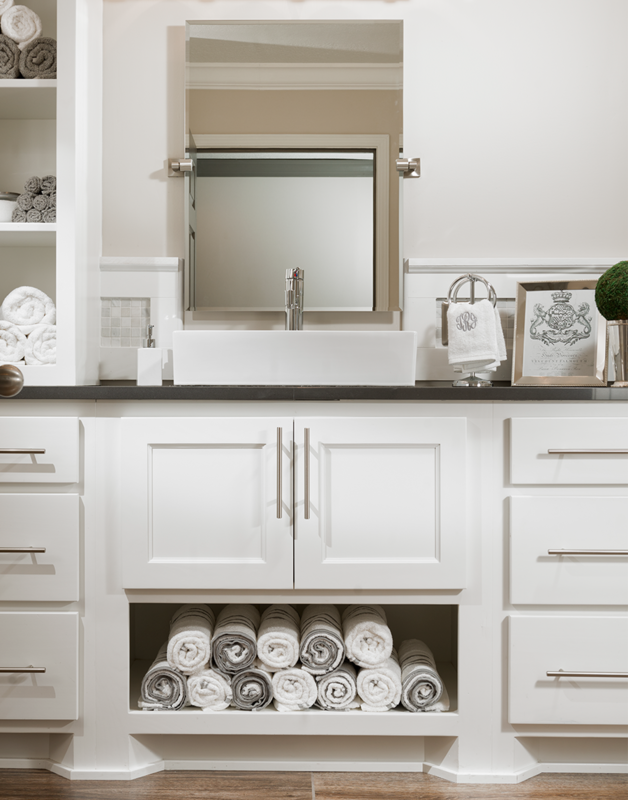 The powder bath features a custom-made cabinet and sits right beside the guest bedroom. An old sun porch became what is now the family room. “I just call that room Mike’s room,” Tracey says. 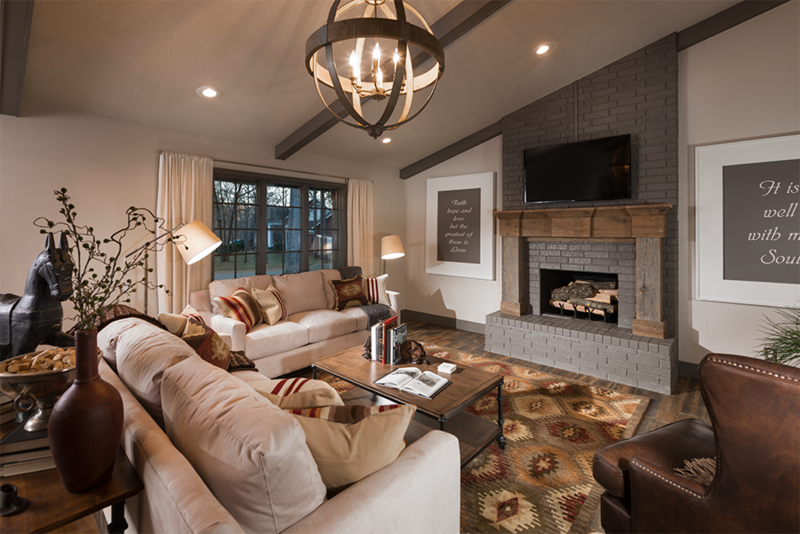 “That’s where he watches his sports and CNN.” The room’s ceiling was painted gray to go with the rest of the home’s color palette, and a heated slate tile floor was installed to help with warmth. “We had never really had that flooring before, but it is great,” Tracey says. “We didn’t even have to turn on the heat last year.” The room also features plenty of cozy seating and a custom coffee table that was also made by Beauchamp. A wall that separated the living room and kitchen was removed in the remodel, so it now flows as one large, open space. 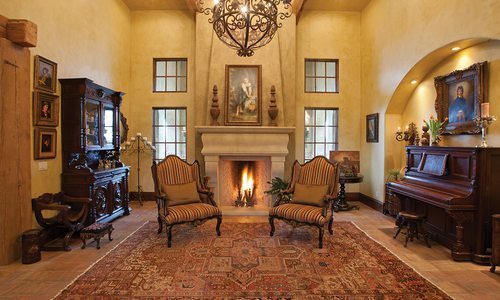 The brick fireplace was painted gray, and so were the beams that line the vaulted ceilings. “We really loved the high ceilings,” Tracey says. “They’re one of the reasons we decided to buy the house.” The room’s old carpet was removed and replaced with hand-scraped pine. “We couldn’t find the exact color we wanted, so Beverly and Brock made it themselves,” Tracey says of Moore and her husband, Brock. “They stained it with five or six stains to get the right finish.” The custom floors also flow through the entryway, the kitchen, the office and the hallway. Brock also helped create the custom staircase, where he substituted traditional wood railings with pipe that was painted black.